This weekend the UFC will attempt to distract the world from the unbridled ‘McGregor Mania’ by holding two events on two different continents on the same night. Trouble is, three of Conor’s team-mates are fighting on the events, which pretty much guarantees his name will be dropped liberally throughout both TV broadcasts. UFC Fight Night: Nelson vs. Story in Stockholm, Sweden sees Gunni Nelson and Cathal Pendred flying the flag for Irish MMA amongst a cast of international fighters. Though Gunni Nelson is Icelandic and will be representing Mjolnir MMA Gym in Reyjavik on the night, he has trained under John Kavanagh at the Straight Blast Gym in Dublin since he was 16. In addition to training a lot in Ireland most of his early professional fights prior to signing with the UFC were in Ireland also. After taking 2 years out from MMA to compete on the international grappling circuit, many people have the Brazilian Jiu Jitsu black belt labelled as purely a ground fighter. However, before heading to Dublin to train with John Kavanagh Gunni was KO’ing people for fun as Iceland’s karate champion. Only a draw in Gunni ‘s MMA debut prevents his record from being a perfect 14 wins from 14 fights. More importantly his record reads 4-0 since signing with the UFC and the Icelander is currently ranked #12 in the welterweight division. This weekend in #UFCStockholm Gunni fights UFC vet Rick Story in the main event. He believes one more win after a victory in Stockholm should put him in the title picture. If you run your finger down the Old Belvedere senior cup winning team of 2005 you’ll recognise some of the names like Ian Keatley, Eoin O’Malley and Cian Healy who progressed their careers to a professional level. You’ll also spot the name of Cathal Pendred nestled into the pack. Shortly after winning the senior cup Cathal moved away from rugby and began pursuing his Mixed Martial Arts career. At the time MMA was hardly a lucrative career choice, especially compared with that of professional rugby. But Cathal’s career is a testament to hard work and dedication being the backbone to any success life brings you. His route to the UFC could easily be labelled ‘if at first I don’t succeed, try and try again. Always his own toughest critic Cathal was disappointed with how involvement The Ultimate Fighter 19 played out. Though he lost a razor thin decision in the semi-final to the eventual winner, Cathal knew he was better than the TUF series might have people believe. 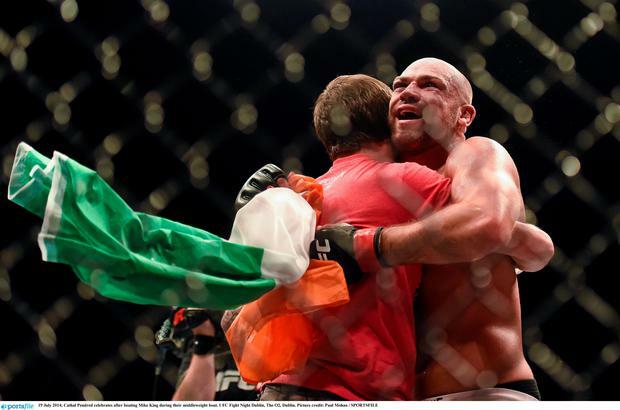 After his epic come from behind victory at UFC Dublin, UFC president Dana White made a point of sprinting back stage to embrace the Irish fighter and acknowledge the incredible mental and physical strength Cathal showed to battle back and finish Mike King in the 2nd round. 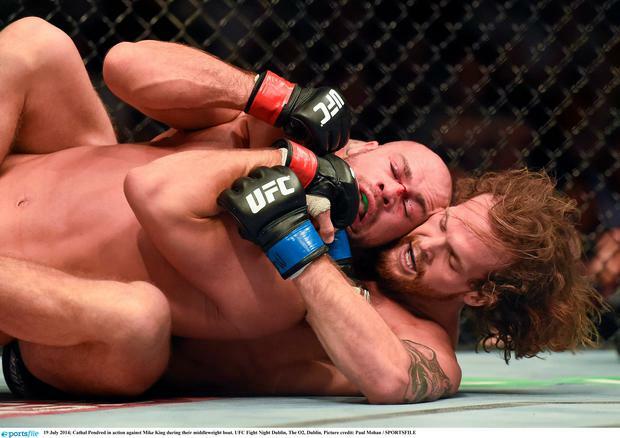 Cathal will look to double his wins in the UFC against tough Russian Gasan Umalatov on the preliminary card in Sweden. A supremely confident Paddy Holohan kicked the UFC Dublin crowd into overdrive by dominating his opponent from the get go sealing victory after only 3 minutes of the first round. The UFC were quick to get Paddy back into the Octagon announcing his next fight against #13 ranked Louis Gaudinot for UFC Fight Night: MacDonald vs. Saffiedine in Halifax, Nova Scotia, Canada. Gaudinot was forced to pull out of the fight due to injury. The Tallaght man now faces Chris Kelades. Fighting a short notice replacement can be a double edged sword. Yes, Paddy will have a full training camp behind him and should be better prepared. But Kelades is an unknown quantity and has nothing to lose. It probably wont bother Paddy too much who his opponent is. Will Conor McGregor get his UFC title shot? Stephen Findlater Loreto face the toughest possible quarter-final in the EuroHockey Club Cup as they look to dethrone Den Bosch, the dominant force for almost 20 years, when they meet in Amsterdam. John Brennan Ireland’s Sam Bennett finished second on today’s stage of the Tour of Turkey – but a time bonus won at the finish line extended his lead to 20 seconds overall.